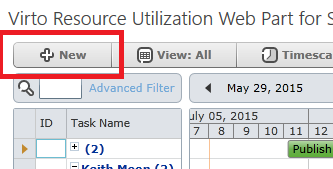 Virto Resource Management web part allows users to create task right in the web part. The same changes will be done in SharePoint list. You can easily create a task using the mouse. To create a task, click an empty area in the chart portion of the Resource Management chart where you want the task to begin. Drag to the left or right until the new task bar represents the duration you want. Use Ctrl to change a start date. Then define task title and other data in the pop-up window. Created task will appear in the chart. This option is default; you can switch it off in data source settings to create tasks in a standard way. You can use standard mode to create tasks – with “New” button. New task will appear at the end of the list. Type the title (“New task” by default) and define start and end time of your new task. The task will appear in the Resource Management chart on the right as well. You can also use other modes of task creating. Please see the details in New Task Mode section.